There’s nothing like feeling like you’ve been heard. 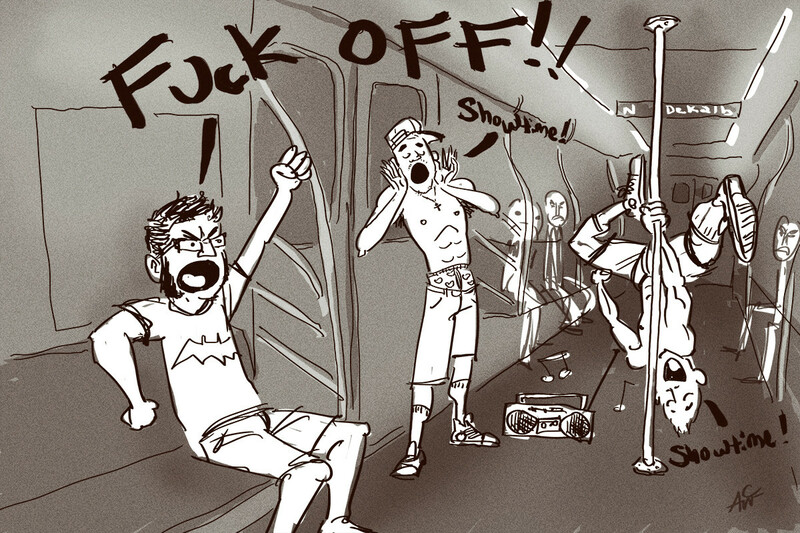 Last year, we posted 5 reasons that “it’s showtime” in the subway needed to end. We envy those of you who haven’t had the pleasure of witnessing the horror of a group of moderately talented urchins shout “IT’S SHOWTIME” and proceed to spin their Air Jordans in your face as they “perform”. Who’s impressed by this? German tourists, people from Kansas and no one else. So imagine our unbridled glee when news broke that new (old) police commissioner Bratton laying the smackdown with a crackdown on this menace. Reports say that this year alone the MTA forwarded 21 rider complaints to the NYPD about them – and an undercover operation busted a group of dancers who were getting a little too aggressive in making space for their performance during rush hour. So here’s our 3 reasons the NYPD’s effort to shut this “entertainment” down is a good thing. 2. It’s really just glorified panhandling…except RIGHT UP IN YOUR FACE. 3. This will make every real New Yorker happy. For real. There was a fantastic moment with these kids on my commute home the other day. They tried to start their routine on a very crowded Q train and nobody moved. After 2-3 attempts to get people to clear a space nobody moved and nobody paid any attention to them. Eventually they stood quietly for the rest of the ride. War: Not Just something Roger Waters whines about.